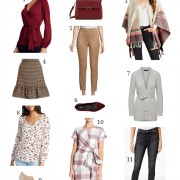 Ruffles & bell sleeves are both big trends for the season and I already have a few blouses in this style…but when I came across this sweater, it was love at first sight. I scooped it up a couple weeks ago during a sale & was so happy that our weather cooperated so I could wear it. Even though it’s a cable knit, it’s very lightweight & it comes in 5 pretty colors – it would be great dressed down with jeans or paired with a pencil skirt. I layered a silky peplum tank underneath to give it an even more feminine sophisticated feel.